This web page was produced as an assignment for Genetics 677, an undergraduate course at UW-Madison. Protein domains are the structural units that can fold, function, and exist independently of the entire protein chain. Domains are often the active portion of a protein, defining the types of functions or interactions a protein will have. For this reason, domains are often conserved through various species and through proteins with similar action. Domain analysis provides insight into a proteins mechanism of action. 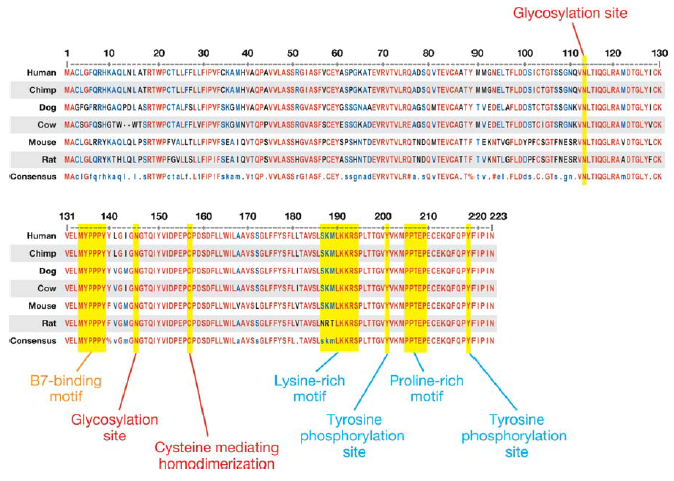 Several protein domain databases such as SMART, Prosite, and Pfam can be used to identify conserved domains and functional sites within a protein of interest. What is a protein motif? A motif is a short sequence of nucleotides or amino acids that can be distinguished as having some type of biological activity. The biological function of the motif may also imply conservation through different species. Programs such as MOTIF can identify protein sequence motifs through multiple sequence alignments. MEME is an additional tool used to created sequence logos that help determine motif conservation.